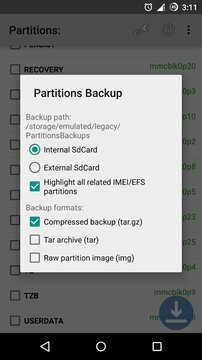 Partitions backup detects all your device partitions, including Bootloader, Kernel (Boot) and any sensitive partitions like the EFS (IMEI) and Modem partition, and let you easily make a backup of them. ☆ The backups are saved on /Sdcard/PartitionsBackups. 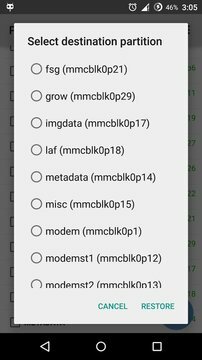 ☆ Do NOT use the restoration feature for tests purposes, it is recommended to use it for small partitions only (Boot, Recovery, EFS, Modems...), you can restore other partitions backups with Fastboot, adb dd, Odin or any other flashing tool depending on which device you are using. 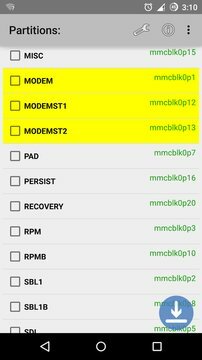 ☆ Partial support for Mediatek devices: some partitions are not displayed because they do NOT have a specific block number for device mapping. Thanks to GadgetHacks/Wonderhowto team for the video. Add date: 02 октября 2015 г.